Spectators were claiming prime vantage points in Cookstown the night before the Twelfth parades – such is the spectacle of the colourful Orange demonstration making its way along the Ulster’s widest main street. By early yesterday morning every parking space was taken and the 20,000-strong crowd began to assemble for the greatly anticipated event. Sophie Young from Ballinderry who took part in her first Twelfth of July celebrations held in Cookstown. Cookstown Ulster Unionist councillor Trevor Wilson was one of the organisers of this year’s demonstration. “We have 50 bands and 70 lodges so it’s quite a spectacle,” he said. “Standing in the field I can see nothing but people, stalls and young people. And the young people are the most important thing here. “These young people are participating with the bands, and indeed walking with their fathers, grandfathers and other relatives in the lodges. Mr Wilson the Tweflth remains an important day in his family calendar. “I am here with my grandchildren and my two-year-old granddaughter is looking me to go a bouncy castle. I think the emergency services would need to be on stand-by to pull me out of it if I did,” he joked. “It is held every seven years here and police are estimating somewhere around 20,000 people in Cookstown to watch it. The cars were being parked in the best vantage points from last night. Mr Wilson said the Cookstown demonstration is as popular as ever. “I have been walking on the Twelfth for more than 40 years and today has been by far the biggest crowds I have ever seen [in this district]. The largest number of spectators, but also from the Orange Order and bands,” he said. Addressing the crowds from the platform at the demonstration field, Grand Master Edward Stevenson said there is “nothing more satisfying as a Tyrone Orangeman” than to parade on the Twelfth in you home county. The grand master used his speech to pay a warm and poignant to the late Drew Nelson. “Among those no longer with us since we last met on this occasion is of course our former esteemed Grand Secretary, Drew Nelson. “Drew, as well as being a personal friend, was a towering figure within the Orange fraternity, whose influence and strategic vision was highly respected and admired beyond the confines of the lodge room. Drew’s contribution to promoting our tradition, one he was proud to represent at every opportunity, was simply outstanding. “No other Orangeman, of perhaps any generation, will ever match his motivation and desire to see the Institution he loved succeed and flourish,” he said. Former DUP MLA Ian McCrea also noticed people parking their cars in the best vantage points last night. 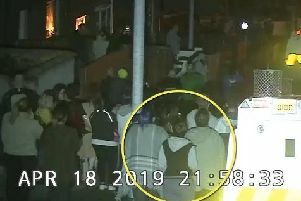 “As we were coming home from the bonfires people were parking their cars on the main street, and there were more claiming their spots from early this morning. Mr McCrea was enjoying the day with his three children aged from 11 to 18.